I’m guest hosting Treks in Sci-Fi! Every other week, Rico over at the Treks in Sci Fi podcast has willing listeners take the reins of his venerable show to talk about a genre topic that interests them. This week was my third turn at the helm and I decided to mash up TrekSF and UMBCast. To that end I talk all about the two really great 1992 and 1993 Interplay games Star Trek: 25th Anniversary and Star Trek: Judgement Rites. I may still cover these games on UMBCast in the future, but for now enjoy this fun look at two really awesome Star Trek adventure games! So enjoy this pseudo-bonus cast and get ready for some Mechwarrior talk this Thursday! 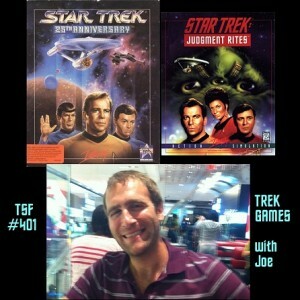 Check out the show notes and listen or download Treks in Sci Fi episode 401! Loved that episode. That’s what brought me to this podcast.